The Jiggig Dungeon is only accessible during and after the Zogre Flesh Eaters quest. The dungeon is overrun by Zogres and Skogres. The Undead Ogres are aggressive if you are not already 89 Combat or higher. They are immune to most attacks apart from Brutal Arrows fired from a Composite Bow. You will be diseased when you are attacked by an undead Ogre in the dungeon. The disease will gradually reduces all your stats other than Constitution. The only cure is to drink one dose of Relicym's Balm. After starting the Fairy Tale Part II: Cure a Queen quest, you will be allowed use of the Fairy Rings. You must have either a Dramen Staff or Lunar Staff to use fairy rings unless you have completed A Fairy Tale Part III: Battle at Orks Rift. The combination for the nearest Fairy Ring is "BKP." When you arrive, walk east past the ponds and through the trees. This route is about the same distance as the Fairy ring, although there is a bank nearby. You may use the Ring of Dueling to teleport you there. Head east over the bridge. Then carry on south over the second bridge. The nearest teleport is the Watchtower Teleport. If you have a house in Yanille you can use the House Teleport to take you there. Watchtower Teleport requires the competition of the Watchtower quest. After completing the Enlightened Journey Quest you may use the Hot air balloon transport. 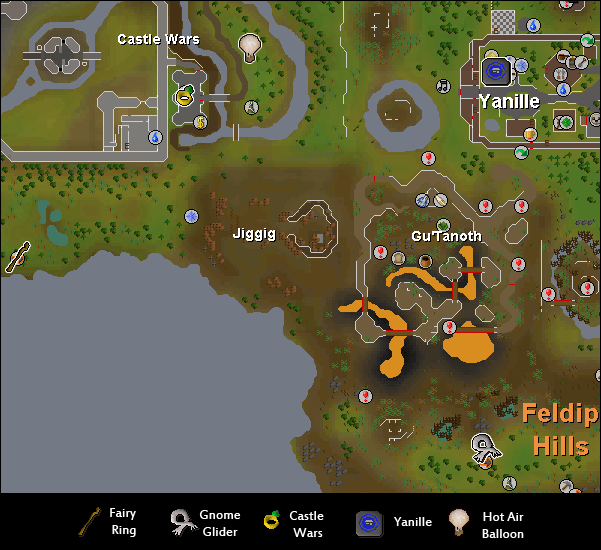 After unlocking the location you will only require one Yew Log to transport there as well as 50 Firemaking. Head south over the bridge and keep walking south. You can only enter the dungeon after starting Zogre Flesh Eaters. To get past the barricades you must climb over the Crushed barricade behind the Ogre Guard. The Zogres and Skogres are aggressive. Head east until you reach the stairs and then climb down. The barricades are a great safespot to range from as the undead Ogres cannot reach you. 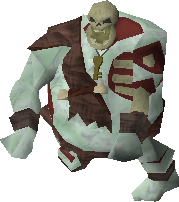 The Undead Ogres always drop Coffin Keys. 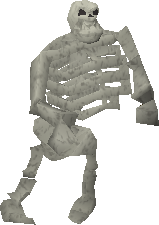 Using them with the various coffins spread across the dungeons you can receive an Ogre Bone. 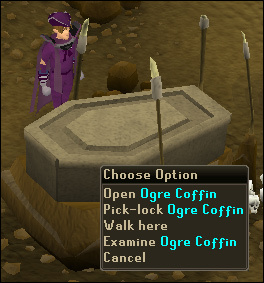 There are 3 different Ogre bones and they are randomly selected when you open the tomb. 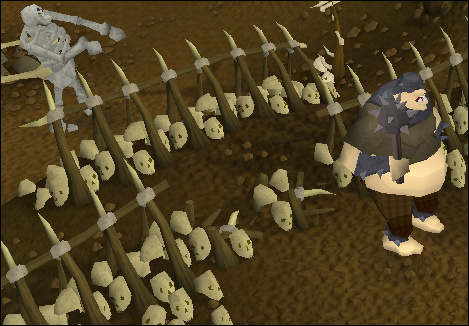 At level 20 Thieving it is possible to steal from the coffins without the use of a key. In the southern part of the dungeon are two twin doors. Past the doors are stairs leading the arena where you fight the level 111 Slash Bash during Zogre Flesh Eaters. 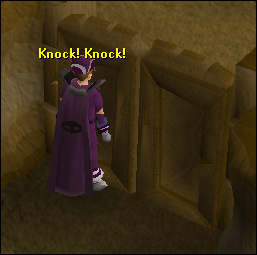 After completing the quest you cannot fight the boss again or pass the double doors. All the monsters are immune to most attacks, apart from Brutal Arrows.